Red velvet cupcakes have always attracted me. There's just something romantic about it. I don't do a lot of baking or desserts because many of the recipes that I'm drawn to makes way more than two can eat - it's excessive! 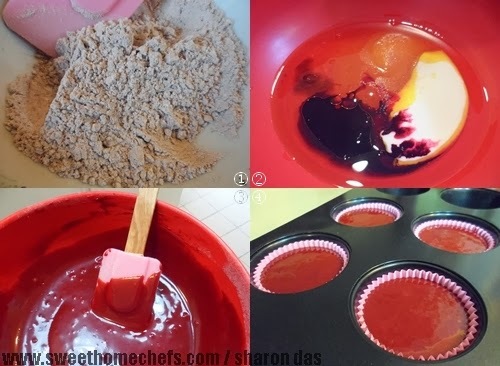 So, I was really excited when I stumbled across this website that had this amazing recipe which makes just four red velvet cupcakes. It was so delicious that I was salivating for more. More! There's none left, of course. It was all gone in a matter of minutes. Now, why did I just make four ...on the bright side, there is no chance of overeating with this recipe. The only thing I did differently is reduce the red food colouring from one teaspoon to 3/4 and sprinkle small sugar decorations instead of chocolate chips on top. Bake today and drool no more! Sprinkle some sugar decorations on top ..voila! Too pretty to eat but too delicious to resist. These are really so pretty! And velvety! Beautiful shots...loved seeing each step in your post! Thank you ~ tastes as good as it looks! I am with you on this one, I love red velvet anything and anything with cream cheese icing. I use the cream cheese icing on alot of different cakes and cup cakes. Wah, so nice! My birthday is coming!! I also want! Hahaha! can i have that for christmas... i love red velvet cake. After reading your post I wanted red velvet cake and cream cheese icing so I had to make a cake!!! Just read your post, Michael and I'll say it again "whoa...!" Sharon those pictures are fantastic! My mouth is watering just looking at them. I'm 42 and I had my first experience with Red Velvet this past summer and I completely understand why people freak out over this stuff! Haha...it is so good, it's hard not to have more than a couple!